We’d love your help. Let us know what’s wrong with this preview of A Divided River by Christian Ellingsen. As the tides turn and the riverbed is exposed, mudlarks search the silt for valuables that have been washed into the Sini. In The Mudlark’s Tale, one mudlark’s find may be worth far more than he first thought, but it comes Vasini, founded and rebuilt from the ashes left by the fall of the deities. A city-state divided by politics, class, philosophies and by the Sini river. To ask other readers questions about A Divided River, please sign up. It's not badly written, and there are hints of interesting politics in the world-building, but I think this collection might make sense if you've read the books it (indirectly) relates to. As a point of entry into Vasini, I found it disjointed and confusing, with no reason to care about the characters and my grasp on the setting more informed by the historical cultures it riffed off rather than the text itself. With little resolution at the end, it left me irritated rather than dying to know mor It's not badly written, and there are hints of interesting politics in the world-building, but I think this collection might make sense if you've read the books it (indirectly) relates to. As a point of entry into Vasini, I found it disjointed and confusing, with no reason to care about the characters and my grasp on the setting more informed by the historical cultures it riffed off rather than the text itself. With little resolution at the end, it left me irritated rather than dying to know more. For those who have read the books, this may be an intriguing glimpse into the broader context. I hope. 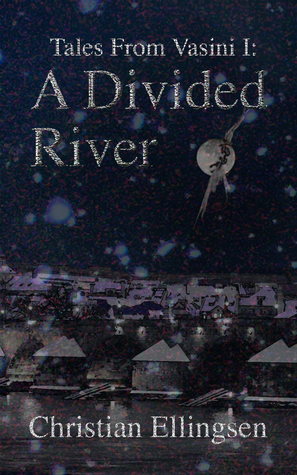 A Divided River contains a short story (The Mudlarks Tale) and a novella (The Winter Fayre) set in the city of Vasini; the two are companions to Ellingsen's series The Vasini Chronicles but do not contain the main characters from the series. The Mudlarks Tale is the story of Ned and his discovery of a mysterious chain. The Winter Fayre features a kaleidoscope of characters through a day in Vasini - the first day of the Winter Fayre. Intrigue ensues as their stories brush past each other on the ic A Divided River contains a short story (The Mudlarks Tale) and a novella (The Winter Fayre) set in the city of Vasini; the two are companions to Ellingsen's series The Vasini Chronicles but do not contain the main characters from the series. The Winter Fayre features a kaleidoscope of characters through a day in Vasini - the first day of the Winter Fayre. Intrigue ensues as their stories brush past each other on the ice. These stories are well paced and compelling; I'm eager to learn more about what drives this city and its occupants! They hint at some great world-building, with characters I've been left feeling concerned for. This is a collection of a short story and a novella, set in a world created by the author. It was hard to decide upon a star rating as my opinions of the two works were different. Firstly, the short story: A definite four star. A wonderful moral tale that is just a little bit creepy and, to be honest, I could have read more. I could well imagine using this story with an English class, as Ellingson is great at the 'show don't tell' concept. This story reminded me a great deal of Scott Lynch's 'The This is a collection of a short story and a novella, set in a world created by the author. It was hard to decide upon a star rating as my opinions of the two works were different. Firstly, the short story: A definite four star. A wonderful moral tale that is just a little bit creepy and, to be honest, I could have read more. I could well imagine using this story with an English class, as Ellingson is great at the 'show don't tell' concept. This story reminded me a great deal of Scott Lynch's 'The Lies of Locke Lamora,' a novel which I greatly enjoyed. Secondly, the novella. Only two stars for this one I'm afraid. As other reviewers have said, it was slightly confusing to keep all the characters straight in this fantasy world and a piece of writing this short. I have not read the first novel set in this world, so I am inclined to think that if I had more background knowledge then I would have followed the story better. The short story, easy to read, page turner, waiting for more. to let you think: _"Should I continue to read, will I understand!?" A reasonable set of fantasy stories with a good pace but I did not find them exemplary. It is possible if I read Silver Mask I would have found more in them.